ETA-TC0 platform is a set of silicon IPs specifically designed for ultra low voltage energy harvesting down to 20mV. ETA-TC0 is Integrating the Ultra-Low Voltage booster Transistor and the Ultra Low Power Oscillator and Bandgap voltage reference IPs. 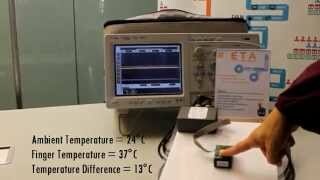 ETA-TC0 demonstrate the ability to extract, using a TEG on the body, the power needed to switch-on our Ultra Low Power Voltage and Time Reference.